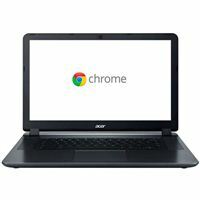 The Acer Chromebook 15 CB3-532-C4ZZ is a feature-rich, ultra-affordable large screen Chromebook. Enjoy immersive visuals on the large 15.6" Full HD display, which is the largest display on any Chromebook. With Intel dual-core processing and dual-band 802.11ac wireless technology it loads content-rich webpages quickly, provides brilliant video playback, and lets you multitask effortlessly while delivering amazing 12 hours of battery life. And, thanks to two full-sized upward-facing speakers, movies and your favorite songs sound pitch perfect. It all adds up to the right mix of features to make you think bigger and reimagine what's possible with a Chromebook. 19.57" x 2.56" x 12.05"